So, today the second post of my little series about weaving adventures! (First one with general explications here). I use the book Weaving within the reach as an inspiration to try out different techniques – this week weaving without a loom. Normally you use a chunky yarn, 1 skein of Knit Collage Wanderlust. The yarn looks wonderful in the book….. and it’s very expensive…. This was meant to be more of an experiment and I wasn’t sure about the finished object…. I must admit I don’t wanted to spend immediately about 50€ for a skein of yarn. But I don’t have any other chunky yarn in my stash either… so finally had the idea to try making the pillow with some roving. And it works out much better than I had thought. The pattern is easy to do (I think it’s self-explaining?). Even the sewing part wasn’t too problematic. I’m happy with the result, though, to be honest, the pillow is more decoration than really usable I’m afraid. The roving won’t resist abrasion of use. So finally I think I’ll make another one either in the original yarn or perhaps I’ll try to spin a chunky yarn… we’ll see…. Ah, you’re astonished?? This doesn’t look like a bowl you say….?? Yep… This one completely failed I’m afraid…First I tried the bowl… the technique isn’t even difficult…you weave around an existing bowl…But: First of all my yarn get tangled all the time (I think I spend 1.5h only trying to untangle the yarn to continue my work)… next, when I removed the wooden bowl, my woven bowl collapsed immediately…no resistance at all… perhaps I had woven too loosely or the wooden bowl was too wide I think… anyway, couldn’t stop with a flop like this… so I tried to weave around something smaller and higher and tightened up every stitch like a mad… with the result that I couldn’t remove the bowl inside at all… I pulled, I pushed, I had to reopen ( I must admit I nearly used my scissors) … finally I got the bowl out…but the finished ‘object’ looks a bit banged up now… but no way I redo this! At least not immediately… such a shame as I really love the pattern of the bowl…perhaps next month??? 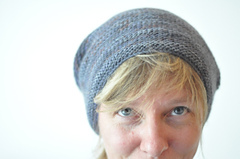 There are two other patterns without a loom I’d love to try… but hadn’t received the materials in time. So perhaps next week I’ll show one or two more patterns without a loom before starting the categories “weaving with a simple, selfmade loom”… stay tuned! Magnifique ! J’ai hâte de lire la suite de tes très belles expérimentations!! Merci Nath!! J’attend encore des matériaux pour expérimenter, mais en touts cas c’est rigolo!